Earlier this year, Aspendale’s first ever ‘pop-up’ disc golf course was created in the Yarrambook Nature Reserve by a Kingston local, and Melbourne Disc Golf member. The dynamic course has a very interesting story behind it, featured below in our Q & A with course creator Darren, and is well worth a visit this Summer! What was your inspiration behind creating the course? Being a first time dad, playing a round of (ball) golf meant 4 or 5 hours away from my baby mama and daughter and that time commitment just wasn’t realistic but I needed an outlet. I’ve always loved Disc Golf, growing up in Vancouver where there were lots of public courses, and anything that is outdoors, free and allows you to hang out with mates over some friendly competition (and/or some cheeky beverages) is a winner in my books! What made you pick this location? What we call ‘Aspendale Wetlands’ is a short bike ride from our house, and with it’s open grass, mixture of established trees and lower lying shrubs, and undulating hills, it just seemed like the perfect spot to throw some discs… and that quickly evolved into a project to create our own course and promote it to the local community as an asset to be enjoyed by all! Tell us about how you constructed the course. Going a little rogue, we needed a course that was low cost, and low impact. The “holes” are star pickets topped with PVC pipe lengths which hang from a cross of chains, these budget “tone-poles” are reminiscent of the early days of Frisbee golf, before the baskets as we know them today were even created! It’s a 9-hole course, all par 3, and I tried to make it dynamic and interesting to play whilst trying to avoid throwing through any areas where new plants are establishing. 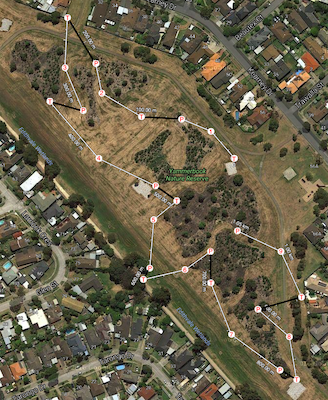 It’s intended for anyone to play; you just bring your own disc along (you can buy them online from Melbourne Disc Golf Club, or loan one from us if you don’t already have one), and print off or refer to our course map on a device. 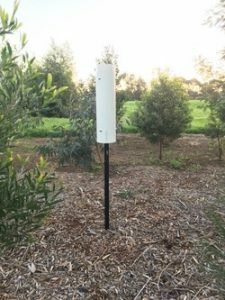 Editor note: When playing the Aspendale course for the first time, Melbourne Disc Golf Club Secretary and Equipment Manager, Jeff Brunsting, fondly recalled the wooden poles that were the course tees when he first started playing back in the 1970’s in the States! So, you have a website for the course? Yes! My wife was keen to help so that was her domain (she even made us a logo! ), and it was a really fun shared project for us. Something to talk about other than the baby! We wanted our website to appeal to the freshest disc golf players around: those who had never heard of let alone played the sport. The website’s got a detailed “how to play” guide, written descriptors to give step by step directions to each tee-pad to accompany the course map, and an online form to ‘vote’ for a permanent course! We tried to make transparent on the website that we’re just a local couple, not a formal club or anything, for liability reasons, but also to demonstrate there’s no money or alterior motive in it for us! What makes the course challenging? 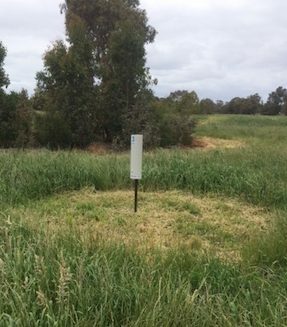 Despite the website being set-up for rookies, the course terrain unfortunately can be quite advanced: when the grass is long, even seasoned experts struggle to find their discs in the sometimes knee high grass! It’s important to get a good visual on where your disc lands and mark the spot mentally with some landmarks to help the game to flow. On a good day, with some seasoned players the course takes about 20-30 minutes, but It can drag out longer for newbies or if you’re playing with kids. The good thing is you can start and finish at whatever tee you like! If you lose a disc, let us know and we’ll keep our eyes peeled for it. Definitely worth putting your name and phone number on the back! What do you hope for the future of your course? Vandals (just kids no doubt) have made some attempts to fly kick the poles, but I’ve been quick to resurrect any bent or damaged pole-holes. We hope we can enjoy the pop-up course for this Spring and Summer! We’d obviously love council and/or Parks Victoria to look at putting in a more permanent course. There are so many great locations in Kingston! Sir William Fry Reserve, Bicentennial Park, Yarrambook Nature reserve, or Braeside or Karkarook Park would be great. That would be amazing! How can we help make that happen? On our website we’ve got a section for people to add their voice to our ‘vote’ that we would like to collate and send to City of Kingston representatives in the near future (once the new Mayor is elected), to express community interest in a more permament course to be established within the municipality. It would be such a fantastic asset for the council, cheap to install and maintain with low environmental impact, and a unique resource in this part of Greater Melbourne. We recognise the sport’s a little obscure, and so the first step we’ve taken is to increase awareness of it, with some flyers and social media posts directing people to the pop-up course, and anyone who’s contacted us to loan discs to play there with, or expressed interest when we bump into them on the course we’ve donated brand new discs to to encourage them to have a go. So, hopefully some good karma comes out of that and people ‘pay it forward’ by spreading the word about this fun sport! Any messages for people who are playing the course over the coming months? It’s important to ensure that walkers and cyclists on the paths have right of way at all times, and obviously we want to also protect the natural environment so being particularly careful with any young trees and plants. Definitely wear closed toe shoes and keep your eyes peeled for drain covers and any sneaky snakes! Make the most of the course after a fresh mow by contractors, keep the kids entertained at the great playground right next to the course if they are too young to play, and HAVE FUN!